Implants, e.g. bone nails and screws for complex bone fractures, may be used to enable or speed up the recovery from certain injuries. These implants are supportive and are not meant to remain permanently in the patient. Unlike implants made from conventional materials like PEEK, magnesium-based implants offer one great advantage: no follow-up operation to retrieve the implant is necessary. The magnesium is resorbable and the implant dissipates over time giving support as long as needed. New materials have to be approved in clinical tests where functionality and tolerance is compared to the current state of the art. The study is carried out on rats. Bone nails made of a different materials are surgically inserted into one hind leg of each rat. The effects of the implants are evaluated by comparing the healing process of the rats, indicated by changes in the blood vessel tree of the operated leg. Angiographies, i.e. MR images specifically designed to show the vessel tree, acquired at specific points in time after operation are used for this purpose. The three-dimensional angiographies are segmented to extract the vessel trees of the operated leg as well as the untreated leg for reference. 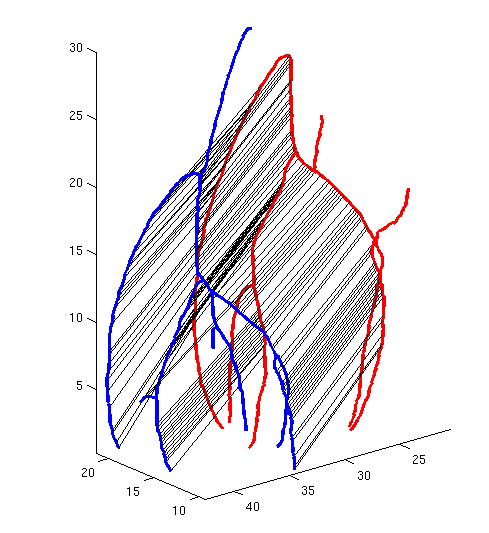 Vessel trees from follow-up examinations are matched to the initial segmentations and differences are measured to indicate changes. 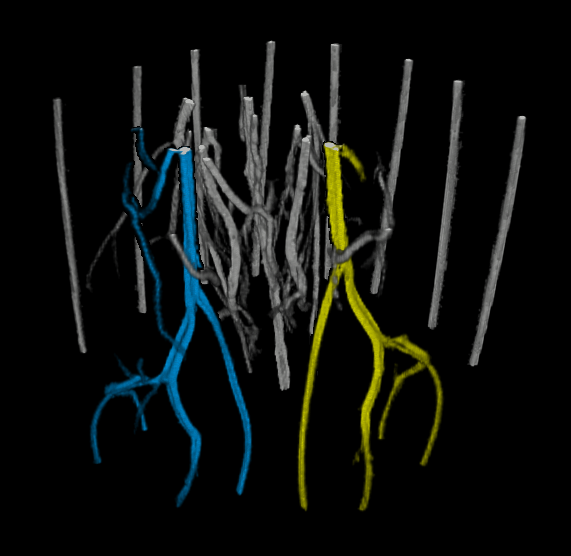 The project focuses on a automatic or semi-automatic method to segment and extract the vessel trees of interest as well as automatic approaches to match and compare different vessel trees using geometric features (additional or missing branches, diameter) or image-based features (amount of blood flow).